7-1/2 centuries later, a young virgin girl in Israel named Mary was visited by the angel Gabriel, who announced to her that she would bear a Son Who would be called Emmanuel, which means "God with us." The books of the Bible which were written after Jesus came to Earth, the "New Testament," tell us that, "Mary said to the angel, 'How can this be, seeing I have not LAIN with any man?' And the angel answered, 'The Spirit of GOD shall come upon you, and the power of the ALMIGHTY shall overshadow you! Therefore that Holy One which shall be born of you shall be called the SON OF GOD! '"-Luke 1:26-35. So even the very BEGINNING of His life on Earth--His conception and birth--were not only unique, but MIRACULOUS, in that the simple and humble young girl who became His mother had never slept with a man! In fact, the Bible tells us that the news of her pregnancy was so shocking to the young man to whom she was engaged to be married, Joseph, that when he learned about it he promptly decided to break off the engagement and call off the wedding!--Until the angel of the Lord appeared to him also, and instructed him to stay with her and rear and protect the very special child that she was carrying. Although His earthly parents lived in the town of Nazareth, 100 miles to the north of Bethlehem, a decree from Rome demanded that all families return to their ancestral homes to register for a worldwide census. The decree came just as Mary's child was due to be born.--Thus God used a Roman emperor, Caesar Augustus, to help bring about the fulfillment of Micah's prophecy. Joseph and Mary journeyed to Bethlehem, and upon their arrival, Mary went into labour, and as the Gospels inform us, "Jesus was born in BETHLEHEM of Judea" (Matthew 2:1), just as the prophet Micah predicted. Micah's prophecy also tells us that the Messiah "Has been of old, from days of ETERNITY." Jesus Himself said, "Before ABRAHAM was (around 2000 before the birth of the Messiah) "Has been of old, from days of ETERNITY.". ), I AM. "-John 8:58. Though born in Bethlehem, Jesus grew up in Nazareth. In His first recorded public address there, He openly declared that He indeed WAS the fulfillment of the Old Testament prophecies regarding the Messiah. While attending the local house of worship, He stood up before the crowd and read a prophecy from the book of the prophet Isaiah. In the passage, Isaiah predicted that the Messiah would be anointed with the Spirit of God to "preach Good News to the poor, to heal the broken hearted, to give freedom to the captives, recovering of sight to the blind and to set at liberty those who are oppressed, to proclaim the acceptable year of the Lord. "-Isaiah 61:1,2. The New Testament tells us that after He read this prophecy aloud to the congregation, Jesus told them, "TODAY is this Scripture FULFILLED in your ears! "-Luke 4:18-21. Modern evolutionists said animals gained new genes by chance mutations, which made them more fit, and which they adapted to evolve into higher forms. Dr. Lee Spetner, who taught information theory for years at Johns Hopkins University and the Weizmann Institute, discredits this in his book Not by Chance: Shattering the Modern Theory of Evolution. Spetner demonstrates that random mutations destroy genetic information and function — they do not increase it. Essentially, chance mutations are to the genetic code what typos are to a book: they remove information, but do not improve it. In humans, mutations cause sickle cell anemia, cystic fibrosis, hemophilia, Down’s syndrome, and thousands of other genetic diseases. Spetner shows that even the rare “beneficial mutations” evolutionists trumpet — such as bacterial resistance to antibiotics — actually result from functional losses. Laws of physics and chemistry can be tested in present time. Evolution, however, mostly constitutes opinions about the past, and one cannot test the past with the same authority as the present. This topic of the earth being at the centre of both our solar system, and in fact the entire the universe (Geo-Centric), & not the sun being at the centre of our solar system (Helio-Centric), is actually today, considered a very revolutionary concept; and at present is totally anathema to most cosmologists, as it would destroy everything that they have learned about the make-up of the universe. After much investigation by the certain cosmologists, they have come to the conclusions given in Genesis, that the earth is actually at the very centre of the universe and that everything revolves around the earth including our sun. The other planets apparently, revolve around the sun, and the sun in turn revolves around the earth. The video really nails the science of this subject, using what Einstein said about the planets, the sun and the earth, and gravitation and his laws of Relativity, along with Sir Isaac Newton’s laws of Gravity, and Kepler’s knowledge of the stars. According to Genesis, the earth was created on one day, and the next day after the sun, moon and stars. ; simply because man does not want to believe in both God, and Him being our creator. A lot more, needs to be said on this one, as all of us when at universities, were taught completely erroneous information in Physics and Astronomy, as in regards to the Cosmos, and its beginning, which certainly was not caused by some sort of ridiculous 'Big Bang' theory and something appearing out of nowhere. I, personally have a copy of the film, ‘THE PRINCIPLE’, but it is a film that you have to buy on-line. I’d say that it is well-worth the money. There is also a 2nd film. 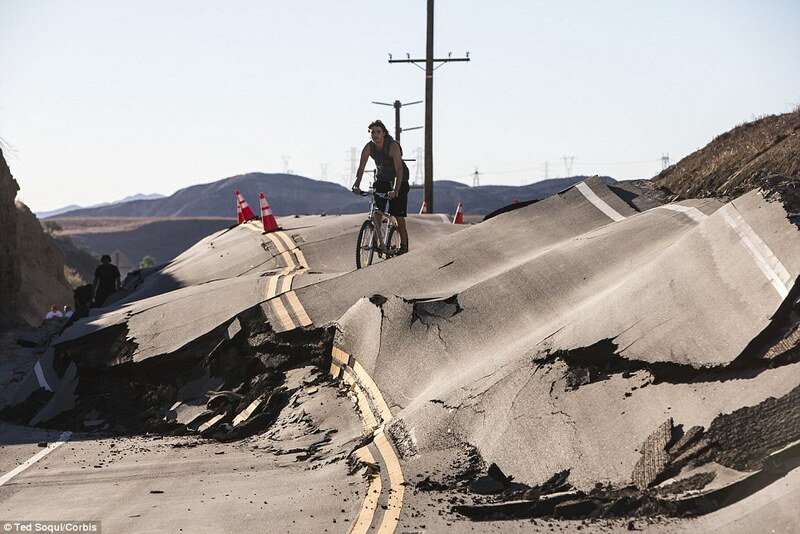 Over a matter of hours a California road went from being a straight and stable thruway to a gnarled mess pushed up by a hillside sliding underneath it. 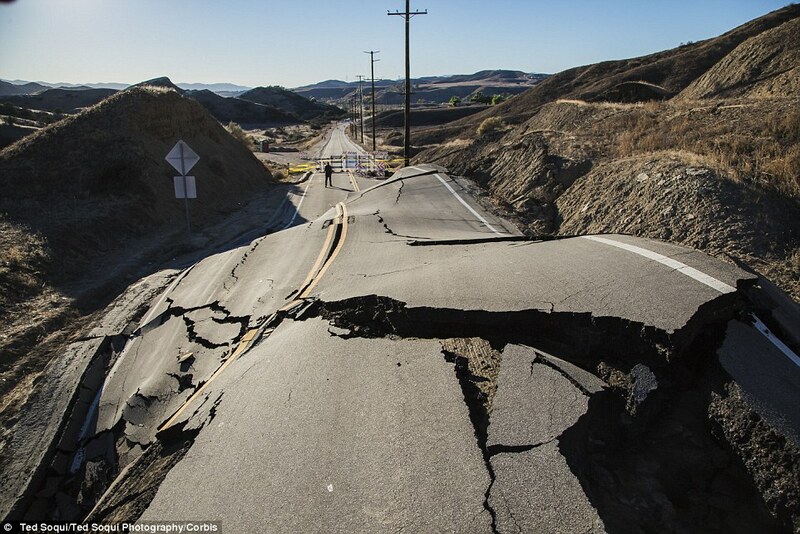 Vasquez Canyon Road, in Los Angeles County's Santa Clarita Valley, has been closed indefinitely after it mysteriously buckled late last week and became an undulating strip of cracked pavement. Pictures show that the road began jutting up quickly on last Thursday, and soil was still shifting in the area on Monday after cracking and rising more than 15 feet in places. 'This isn’t just the road; it’s the mountain itself that’s moving and it’s pushing the road up,' Los Angeles County Public Works's Paul Funk told KTLA. Power poles and lines were tipped over next to the shifting road, though Southern California Edison says it has cut off power to that line and customers received electricity from other channels. Officials said that there was no obvious reason for the hillside to suddenly begin shifting so dramatically. No seismic activity occurred on Thursday to cause the landslide.